Summary of today’s show: The Feast of St. Joseph this year was marked by the inauguration of the Petrine ministry of Pope Francis. Scot Landry and Fr. Chris O’Connor discussed the Holy Father’s newly unveiled coat of arms, which are very familiar, and then talked in detail about his homily for today’s Mass in which he invoked the example of St. Joseph as a protector who acts with tenderness to encourage all of us to protect one another and all of creation. 1st segment: Scot Landry welcomed Fr. Chris O’Connor to the show and they discussed the treacherous weather and how there’s often a bad snow storm at this time of year. Scot said today our focus will be on the Mass of Inauguration of Pope Francis this morning. Scot said we’ll also discuss the Pope’s coat of arms and papal motto. Fr. Chris said the star represents the Blessed Mother and the plant, nard, represents St. Joseph. 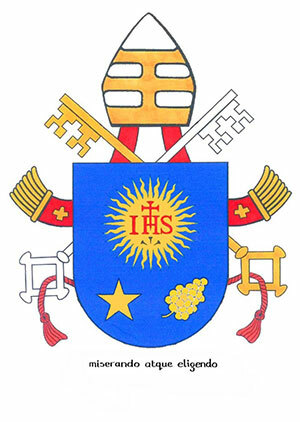 The star and IHS is a common representation of the Jesuits, which Pope Francis has been. He noted that the crest is bright blue, which represents both the Blessed Mother, but also particularly the icon of Mary that all Argentinians revere. Scot said both the crest and motto of bishops represent much of who the bishop wants to be. Scot said the motto comes from the Gospel of St. Matthew, when Matthew was called by Jesus: “Miserando atque eligendo”. It refers to Jesus calling Matthew in mercy. When he was 17, Pope Francis heard this reading at Mass, and feeling unworthy himself felt called by God and that was his vocational call. Pope Francis seems to be telling others that even if they feel unworthy, God is calling them to bring His love and mercy to others. Fr. Chris said Caravaggio shows this in a beautiful image with darkness and light. 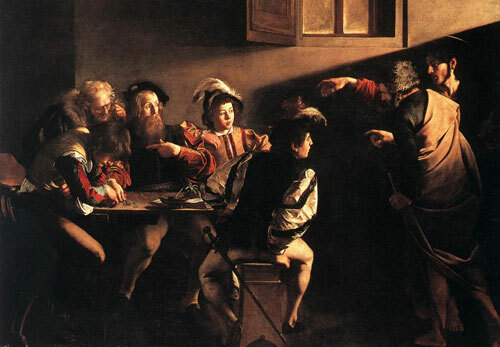 Matthew is shown surrounded by his ill-gotten tax collector gains and then the hand of Christ coming in and calling St. Matthew. Caravaggio modeled the hand of Christ on the hand of God in the Sistine Chapel, thus saying that a new creation begins in the call of Christ. Scot said the only people who might not like what Pope Francis is doing is the security people because the Holy Father so often goes off script and out into the crowds. It’s notable that this morning he was riding in the open-air popemobile. At one point he got out of the car to give a kiss to a disabled man he saw in the crowd. Fr. 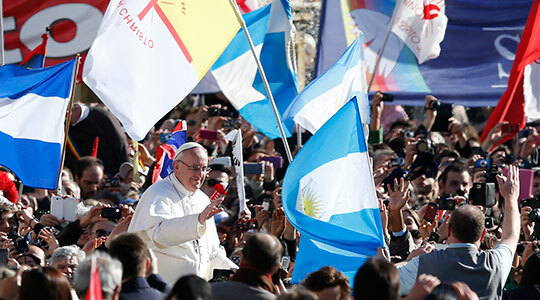 Chris said he was struck by the news that Pope Francis called his former cathedral in Argentina before the Mass today and had a message relayed to the crowds gathered outside to watch the Mass. He said one of Pope Francis’ first acts was to ask for prayer and he’s reminding us of the efficacy of prayer and that even the pope needs prayers. Scot said it reminds him of the need to ask others to pray for him in the normal course of his day. He should also be assuring others of his own prayers and doing it. Fr. Chris said one of the important parts of Good Friday is praying for the world by name, atheists and agnostics, Jews, Muslims, and everyone. The Holy Father is showing us the importance of praying for our needs, our daily bread. 2nd segment: Scot said St. Joseph’s Day is special especially for fathers and grandfathers. Fr. Chris also wished a happy feast day to the Sisters of St. Joseph. Scot said the name day, the ‘onomastico’, is very important in Italy. In fact, many Italians celebrate the name day instead of their birthday. Fr. Chris said Pope Francis mentions Pope Benedict by name once again. He’s scheduled to meet Benedict on Saturday and Fr. Chris said it shows Pope Francis’ humility in going to see the former pope. Scot said St. Joseph is the Patron and Protector of the Universal Church. Fr. Chris said it’s a reminder of intercessory prayer. He said he’s known as the silent saint because no words of his are recorded in Scripture. We see the care, love, and dedication he gave to Mary and the Child Jesus. Scot said Joseph is a man of action, a man of formation. It shows what a faithful holy man should be about. Fr. Chris said the reasons he’s such a great patron for dads is that his holiness doesn’t come from anything flashy or extravagant, but the day to day work of being a father. Scot recalled a talk he heard once encouraging men to raise their own children in the model of St. Joseph. It is a sacred work to be a dad. Fr. Chris said he sees the choice of this day is Pope Francis giving over his ministry to St. Joseph. Fr. Chris likes the image begin developed that in order to live out our vocation, we have to follow the example of St. Joseph who protected Christ. It’s a reminder to protect what’s most important, our relationship with Christ, and to keep away from sin and anything that would violate that relationship. We protect time to pray to Christ. How am I protecting Christ in my life? Scot said it brings him back to the Martha and Mary story, where Martha was busy doing, while Mary was at the feet of Jesus. Scot said in 20 years when people come back to this homily, they will come to this paragraph. Fr. Chris said anyone who comes to Assisi understands the beautiful images and vistas and the wonder of creation that St. Francis loved. Pope Francis is reminding us that all of creation is something sacred and bestowed on us by God, entrusting us with it. Scot said Cardinal Seán speculated that Pope Francis chose this name to emphasize that we are brothers and sisters in Christ, which comes with the responsibility to love and care for one another. Fr. Chris said he thinks it’s no coincidence that he mentions husbands and wives here, their first duty to one another and being the instrument of their sanctification. Scot said in this age of social media it’s much easier to add new “friends” but sincere friendships require deeper trust and protecting them with trust, respect, and goodness. Fr. Chris asked us to imagine a world marked by such friendships. Scot said we’ve certainly seen “Herods” in our lifetime. Scot noted that there were many people there who are not Christian and who watch who aren’t and he was telling all of us to protect each other and nature. Fr. Chris said we have to watch our hearts and emotions because so often that’s where the protection breaks down. Forgiveness is a choice. We choose to forgive. We can acknowledge our emotions and still choose to forgive. We need to integrate the heart and mind, but have the mind and intellect which elevate us above creation, rule over the emotions. Scot said so many men he’s known have thought the way to love, particularly kids, was with tough love and discipline. Scot said tenderness and toughness are often put at opposite ends of a continuum. Pope Francis said one way to be a good protector and provider is to show a tender form of love too. He protected Jesus in a tender way. Somewhere along the way we came to believe that the way to be a man is to show tough love and the Holy Father is saying the opposite. Fr. Chris said he was also tender with the Blessed Mother, like when he decided to spare Mary by setting her aside quietly. And then you continue to see the tenderness along with great obedience and strength in responding to God’s will. Scot said this might be the second-most quoted. He’s describing authentic Christian leadership through service. Fr. Chris said Pope Francis tells us why the Church exists because of the holiness and sanctification of all its members. The what of the Church is the Pope, bishops, priests, and deacons and their reason for existence is to serve. If we lose sight of the call to service, that is not of Christ. Christ is found with the poorest of the poor, the sick and lame. Fr. Chris said Bishop Libasci of Manchester, NH, gave a homily at St. John’s Seminary yesterday in which he described a fire-and-brimstone seminarian who was taken aside and told that before you can save the world, you have to love it. We’re reminded of this on Holy Thursday when the priest washes the feet of others in service. Scot said we need to be willing to lay down our lives so we can serve others in tangible, concrete, faith-filled ways. Fr. Chris said only those who serve with love are able to protect. That’s the Pope’s job: the protect the unity of the Church, to protect the holiness of the Church, to protect the catholic nature of the Church spread across the globe and making manifest the fullness of the teachings, to protect the apostolic faith passed down by the apostles and guided by the Holy Spirit. Scot said he can’t not think of how much hope Pope Francis has brought to the Church. He’s heard from people who tell him that Pope Francis makes them want to return to church. Fr. Chris said of the light of hope that in a dark room, one little match is stronger than the darkness and cannot be swallowed by that. Just a little hope in our lives gives us the grace to carry on even in dark and difficult experiences. Scot said he will remember about this homily, like he remembers about the balcony of St. Peter’s last Wednesday, is that he ends by asking us to pray for him. Fr. Chris said he’s reminding us that we are on flock and that the shepherd relies on prayers just like the sheep. He talks of protecting all the gifts in our life, but also the gift we have been given in Pope Francis. Scot noted that in the Congregation meetings, Cardinal Bergoglio gave an impassioned talk that we need to reform and purify the Church. Scot said that won’t be easy, especially with the reform of Roman Curia. Scot said harder than starting a business is a reforming a business even while it continues to do its work and that’s similar to what Pope Francis is doing. Fr. Chris said Cardinal Seán in his own inaugural address in Boston in 2003 recalled the San Damiano Cross where Christ called Francis to rebuild the Church. He said he believes Pope Francis has a clear idea of what needs to be done. Scot noted that tomorrow is Fr. Chris’ birthday. He said tomorrow is their annual St. Patrick’s dinner and that’s where they’ll celebrate. He noted the celebrate on Wednesday instead of Sunday because so many of the deacons and faculty are out in parishes on Sunday. The one thing that Fr. Chris has loved so far from Pope Francis is the emphasis on the protector. Scot said he’s loved that he preaches from the pulpit like a pastor and not so much like an academic.